This traditional gingerbread recipe can be used to make Gingerbread men or Christmas gingerbread biscuits using Christmassy biscuit cutters such as reindeer, angels, stars, Christmas trees, etc. Children will love to help roll out the dough and cut out the shapes and they can help with the decoration too! Make the dough the day before you want to bake them as it needs to rest. If you are going to hang them from a Christmas tree, make a suitable hole in the biscuits when they are removed from the oven so you can thread a ribbon through. This delicious recipe isn't as sweet as some we have seen, so if you have a really sweet tooth, you might want to add slightly more sugar! These ingredients made around 40 biscuits but, of course, it will depend on the size of the cutters you use. Sift together the flour, ground ginger, cinnamon, nutmeg and bicarbonate of soda in a bowl and set aside. Put the butter and sugar in a large bowl and beat with an electic mixer until light and creamy. Gradually add the beaten egg and golden syrup. Carefully stir the dry ingredients into the mixture. You should end up with a fairly stiff dough, suitable for rolling out. If your mixture is a bit on the sticky side - egg sizes can vary - don't be afraid to add slightly more flour at this stage. Wrap the dough in clingfilm and place in the fridge overnight. Take the dough out of fridge and leave to soften for about 10 minutes. Preheat oven to 170°C, fan 160°C, gas mark 3. Lightly dust clean work surface with flour and roll out the dough to a thickness of about 4mm with a rolling pin. 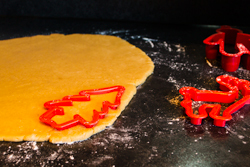 Cut out shapes with biscuit cutters, dipped in flour to avoid the dough sticking. Arrange the dough on the prepared baking trays and bake in the preheated oven for about 10-15 minutes until light golden brown. Leave the biscuits to cool slightly on the trays, before transferring to a wire cooling rack to cool completely. 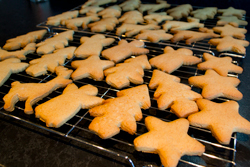 The biscuits will be soft when removed from the oven and will harden when cooled. If you are planning to use as hanging decorations, make a hole for the thread when the biscuits are still soft, using a straw or chopstick. When cold, decorate with icing. 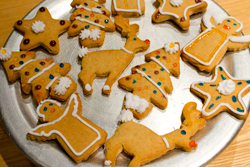 The gingerbread biscuits can be stored for up to two weeks in an airtight container.